August 3. I got to within four miles of the village site and was assured that the Oregon Gulch Fire hadn't jumped the Klamath River despite conflicting reports I had heard that sent me down here. As long as the fire stays on the north side of the river, Coyote's Paw is safe. The road up the canyon is closed. Just too dangerous in there. The area is thick with smoke, and driving past Copco Lake I could see the fire burning in places nearly down to the lakeshore. As I entered the evacuation area, it was eerily quiet. No people except the lone deputy at the roadblock, and lots of animals wandering around looking a bit lost. August 5. This satellite photo shows the proximity of the Oregon Gulch Fire to the native village site of Coyote's Paw, as of this morning. 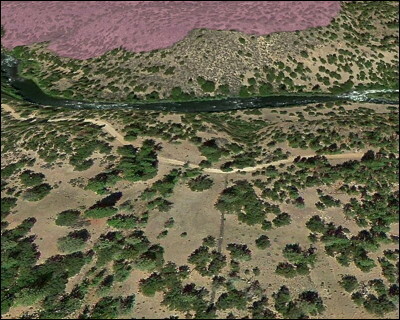 The reddish-pink area is the southern edge of the fire across the Klamath River from the village. If you look closely (below the road), you can see a gray rock wall running vertically. This wall separates the living area in the village from the graveyard. Just to the right of the wall are several gray dots which are graves. August 7. I finally made it to the village site. 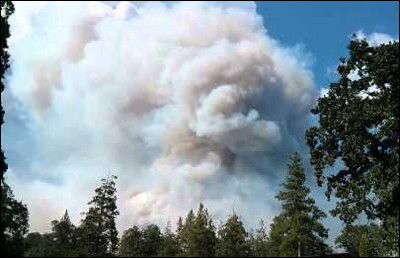 The Oregon Gulch Fire hasn't jumped the Klamath River so the site is safe for now. 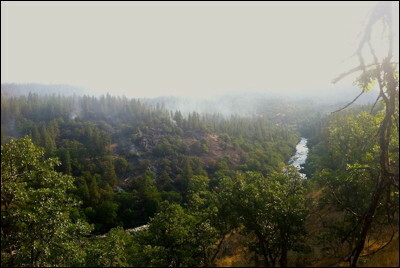 However, the fire is still smoldering in the woods directly across the river from the village, even burning down to the edge of the water. Though I fear what might happen if the wind kicks up in the canyon like it often does, sending embers across the river, CalFire is regularly patrolling the area with engines, and while I was there a helicopter flew over surveying the canyon. And they cut a fire break along the road that cuts through the village. This is all good! While the fire has burned quite a lot of the Oregon side of the canyon, including all around the old Indian cave across the river from the hot springs, I was amazed at how many trees still looked green in the burned areas. It was nice to see folks back in their homes around Copco. August 14: The fire didn't jump the river. Coyote's Paw is safe. 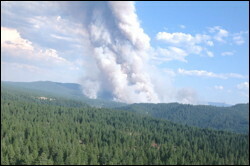 Several rainstorms over the past few days have pretty much doused the fire. 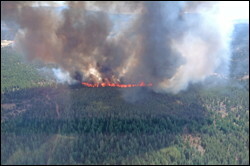 As of today the fire is 100% contained and has burned 35,302 acres.